Harmon Killebrew, likely at spring training, 1955, as a precocious 18-year-old (!) for the old Washington Senators. A great shot of the young player, fresh from the hills of Idaho, with the Sens’ classic understated W, and how about that stylish zippered jersey with the name of our nation’s capital displayed proudly in broad block lettering! A gem all around. The photo is by the prominent baseball photographer Don Wingfield, who worked for the Senators themselves, The Sporting News, and also for Topps, and many baseball cards from the 1950’s and 1960’s feature his work. 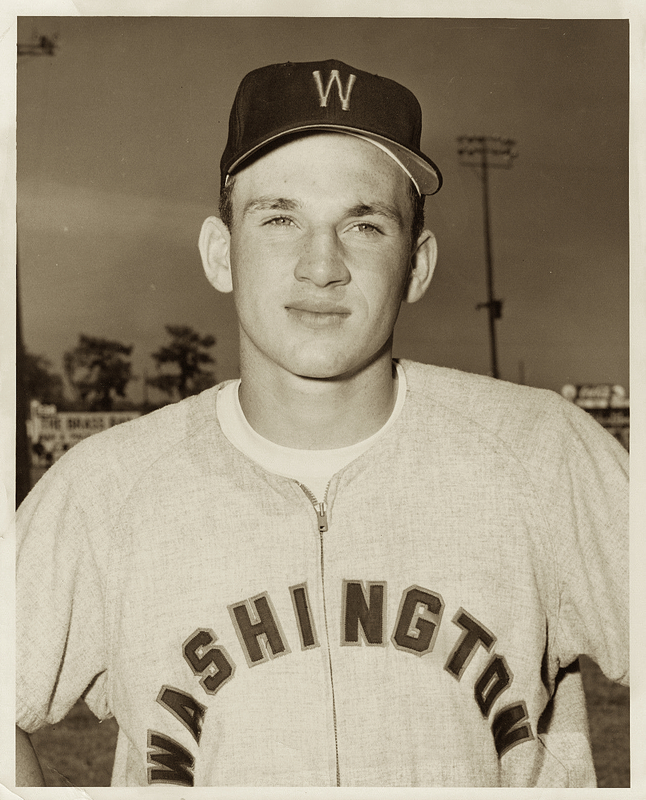 As a “bonus baby” ($4000 bonus along with a $6000 salary) Killebrew was on the Senators’ roster for 1954 and 1955, without having played one minor league game, seeing limited action. But by 1956, he started in Class A and properly worked his way up through the farm system, and after cups of coffee each year, exploded onto the AL scene in 1959, earning an All-Star berth and leading the league in HRs. Killebrew would follow the Senators’ move to Minneapolis for the 1961 season, establishing his HOF career as an 11-time All-Star for the Twins, including his 1969 MVP season. When I was 9 in 1960, I was always Killebrew when we played Home Run Derby. Remember Killebrew well from my youth, but didn’t recall seeing a close shot of him so young, such a striking picture. Take care. Interesting read for Saturday morning. Amazing site you have here! Thanks Chris! Glad you enjoy it. Wish I had more time to write for it! Someday.